I’m delighted to offer Cognitive Hypnotherapy Cambridge at The Coach House Clinic. 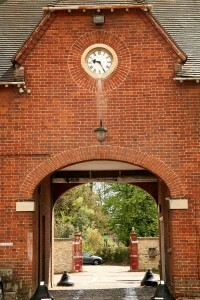 The Coach House clinic is a friendly, welcoming clinic with free parking directly outside. 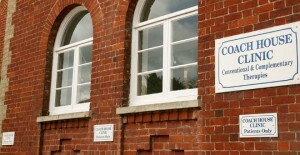 The address of the clinic is Anstey Hall, Maris Lane, Trumpington, Cambridge CB2 9LG. Please see the map below. The Coach House Clinic in Cambridge is easily accessible from M11 and nearby towns and villages such as Bar Hill, Duxford, Histon, Milton and Great & Little Shelford. At my Hypnotherapy Cambridge Clinic I work with professional and creative people during life’s challenges when they might experience anxiety & stress, loss of confidence, relationship issues and addictive behaviours such as smoking or drinking to excess. Everyone is different and some issues are more complex than others. However, many people find that hypnotherapy can be really effective in just a few sessions. * If there is a particular issue you would like help with that isn’t mentioned on my website please contact me to discuss if I can help you. 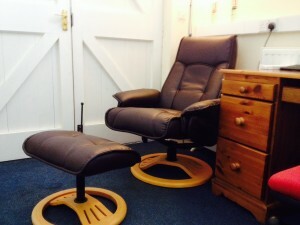 Rooms at the clinic are comfortable with a reclining chair and footstool for hypnotherapy sessions. Refreshments are also available if required. All rooms are accessible on the ground floor. Cognitive Hypnotherapy Cambridge is a flexible, scientific approach to therapy. It uses the latest cutting edge techniques to help you develop your inner resources and achieve your particular goals. We will work together to identify and remove any blocks you have to fulfilling your potential. Although we think we are in control of our thoughts and behaviour, it is our unconscious mind that is running most of our ‘programs.’ Cognitive Hypnotherapy aims to discover and transform the emotional root of a problem.